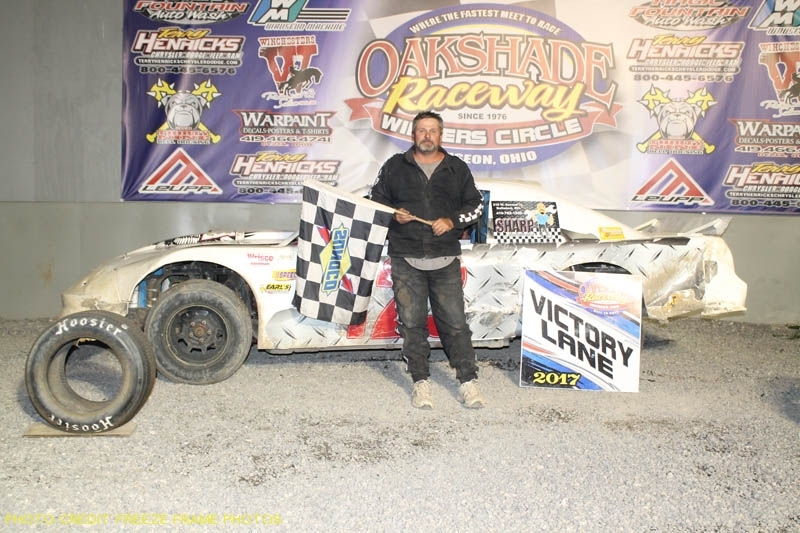 The 2010 Barney Oldfield Race winner, Rusty Schlenk, earned his second ever Barney Oldfield Race win in Saturday night’s 28th Annual Barney Oldfield Race which was part of an American Late Model Series (ALMS) double header at Oakshade Raceway. 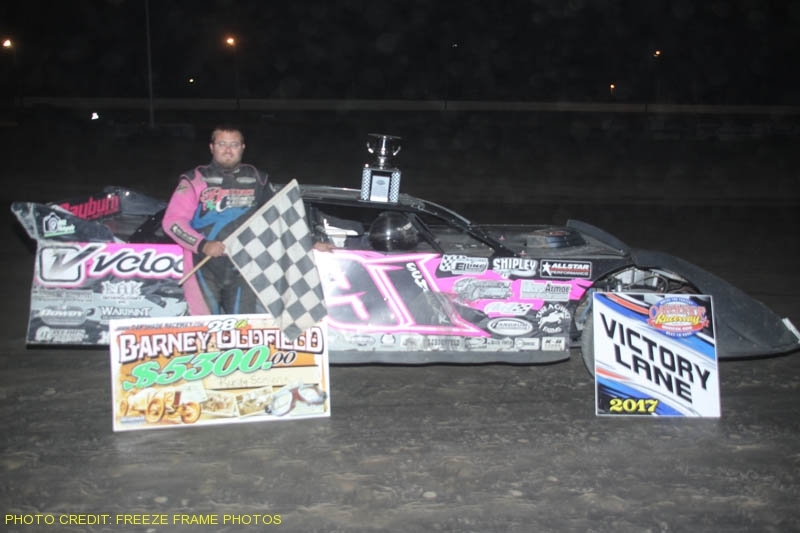 Originally scheduled for mid-June, the 28th Annual Barney Oldfield Race was rained out just before the start of the second last-chance race. That race and the 40-lap, $5,300 to win main event was rescheduled for Saturday night. An incident near the rear of the field on the first lap was the only caution flag of the race and it resulted in a complete restart. At the drop of the second green flag, Travis Stemler got the jump on Curtis Roberts and led much of the race. 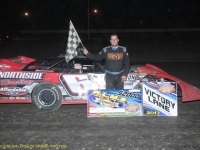 McClure, Ohio’s Rusty Schlenk started inside row two and began to reel in Stemler after taking over the second position early on. Stemler seemed to get through the lapped traffic a little better than Schlenk. Schlenk was able to pull up to the rear bumper of Stemler a couple times and then faded a bit while working through the lapped traffic, but he was finally able to stick with Stemler upon catching him again on lap 28. Four laps later, Schlenk took command and drove away to pick up the checkered flag. Dona Marcoullier made a late charge to get by Stemler for a second place finish with Stever Kester ending up fourth. Jon Henry was fifth. 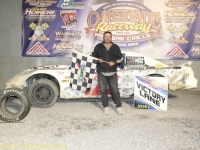 Later in the night was a second ALMS feature event paying $2,000 to win. Devin Shiels started on the pole and took the early lead until Houghton Lake, Michigan’s Dona Marcoullier got by and then set sail. Marcoullier proceeded to open up a big lead leaving Shiels to battle Jon Henry for second. 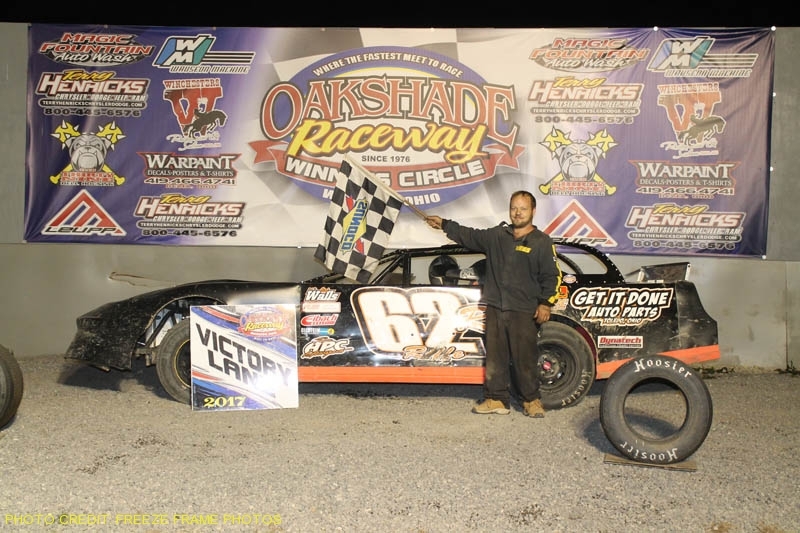 Marcoullier went on for the easy win which was his second Oakshade feature win of the year. Henry survived a bit of a scare, getting up high in turns one and two on lap 16, to finish second. Shiels maintains a commanding 159 point lead after finishing third. Travis Stemler had another top five finish, ending up fourth with Casey Noonan moving up eight spots to finish fifth. 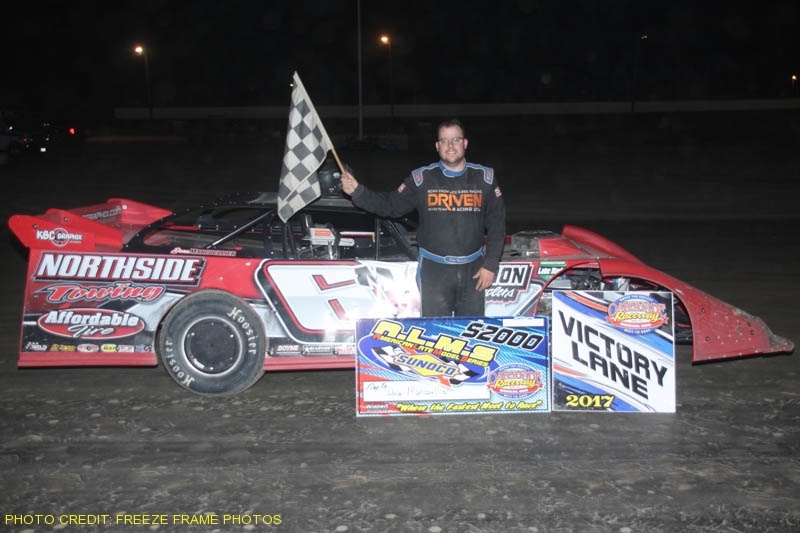 The UMP Sportsman feature event produced the most exciting finish of the night. 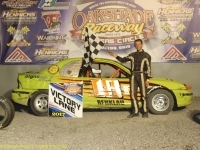 Oakshade Sportsman point-leader Drew Smith started on the pole and darted out to a large lead. 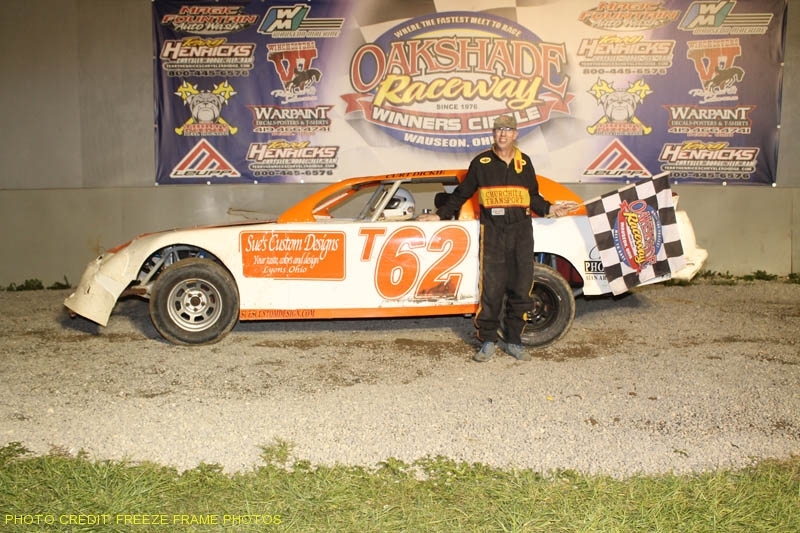 Late in the race, defending track champion Mike Jessen began to nip away at the Sylvania, Ohio, driver’s lead. Jessen made a move to take the lead at the white flag, but the caution would come out right the same time after Chris Williams spun on the front stretch. That set up a two-lap shootout to the finish that did not disappoint. Smith led the field back to the green flag with Jessen in pursuit. It wasn’t until the final corner that Jessen was able to drop down to the inside of Smith making for a side by side drag race to the finish line. 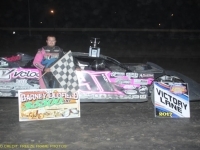 Smith was able to hang on by an inch or two for his second consecutive feature win and his fourth of the season. Finishing third behind Jessen was Rusty Smith who seems to have turned his luck around after posting two DNF’s after leading each of the features the previous couple weeks. Tim Fisher and Bruce Stuart rounded out the rest of the top five finishers. Rich Riffe from Toledo, Ohio, got by Tim Hancock on lap two of the Bomber A Main and never looked back. 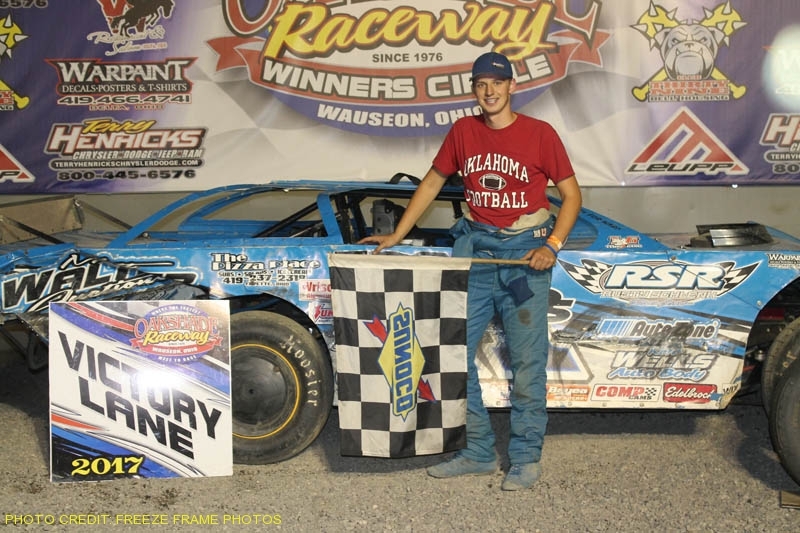 Hancock was able to close back in on Riffe just past halfway in the 15-lap feature, but Riffe was able to hang on to pick up his second consecutive A Main feature win. Craig Dippman finished third ahead of Jeff Foks Jr. who is second in points, just eight behind Hancock. Terry Rushlow ended up fifth. The Compact feature event produced a lot of lead changes. Carter Murday got the lead on lap one, but then pulled off giving it up to Ken Watts. 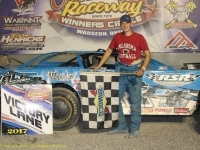 Waldron, Michigan’s Brogan Rehklau challenged Watts for the top spot and got by to pick up his eighth feature win of the year. Watts held on to finish second followed by Jeff Foks Sr., Brandon Myers and Jason Deshler. Foks’ third place finish was enough to maintain a slim 16-point advantage over both Rehkau and Deshler as the season starts to wind down. 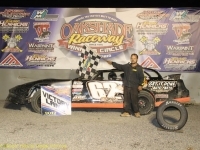 The final event of the night had a first time feature winner. After Brenen Mellon jumped the initial start of the Bomber B Main, Dave McMannamy from Holland, Ohio was scored as the race leader once Mellon’s penalty of two positions was served under a lap four caution. Mellon worked his way back to second but could not catch McMannamy who went on to win his first Oakshade feature win. Mellon held on to finish second with Scott Hammer third. Zach Stotz posted a fourth place finish and Rayce Price was fifth after both drivers started at the rear of the field. 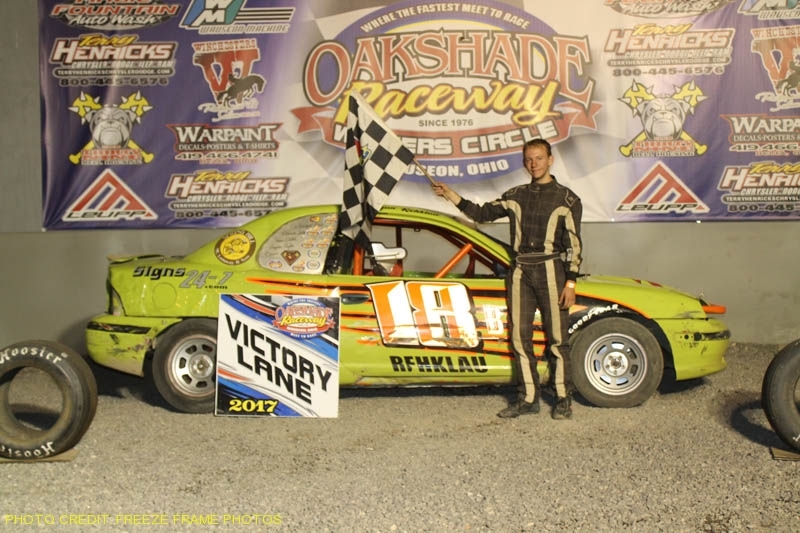 There will be a full racing program once again of UMP Late Models, UMP Sportsman, Bombers and Compacts this Saturday, August 19th at Oakshade Raceway. Gate open at 4pm with hot laps at 6pm and racing at 7pm.